I went to Pouhala Marsh on the shores of the West Loch of Pearl Harbor (Puʻuloa) to visit the wetland during hoʻolio — the rainy season in Hawaiʻi. 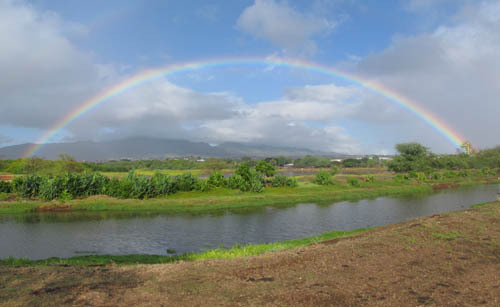 The Division of Forestry and Wildlife (DOFAW) of the Department of Land and Natural Resources (DLNR) of the State of Hawaii and the Hawaii Nature Center began organizing teams of volunteers to restore Pouhala Marsh in December 2001. Since 10 years have past since the first efforts were made, I had to return to see the progress being made to restore this coastal wetland. 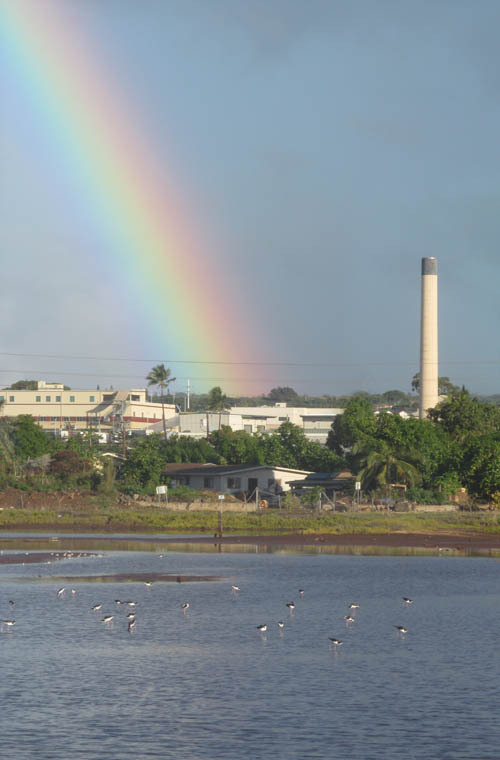 When I arrived at the end of Waipahu Depot Street across from the Honolulu Police Academy, I was pleased to see a good omen — a magnificent anuʻenuʻe (rainbow) arched over Pouhala Marsh from one end to the other. Even more encouraging was how clear the stream and marsh were of old household appliances, furniture, tires and other urban trash and debris that once littered the landscape. Prior to the founding of suburban Waipahu, Pouhala Marsh was a productive wetland abundant in ‘ama’ama (mullet), o’ama (goatfish), and crabs. The Hawaiians also cultivated kalo (taro) along Kapakahi and Waikele Streams which border and supply the wetlands with water. When the plantations and sugar mill were founded, these wetlands were severely degraded by urban development, silt accumulation, water pollution, dumping and invasive species. Over the past ten years, encouraging progress has been made to reverse the damage and restore the wetland. 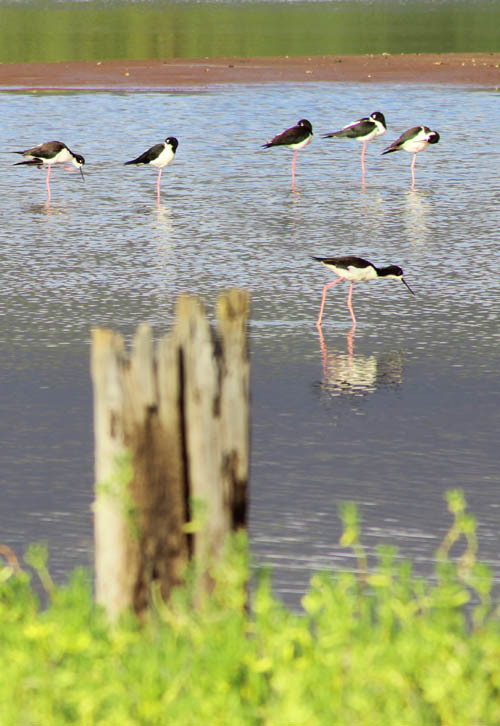 When I scanned the marsh I was thrilled to see roughly 150 endangered aeʻo or Hawaiian stilts (Himantopus mexicanus knudseni) wading in the shallow waters! That last time I was here in June 2008, I saw 15 birds — but that was in the summer months when the marsh has much less water. I was pleased to see so many aeʻo here during the winter months. 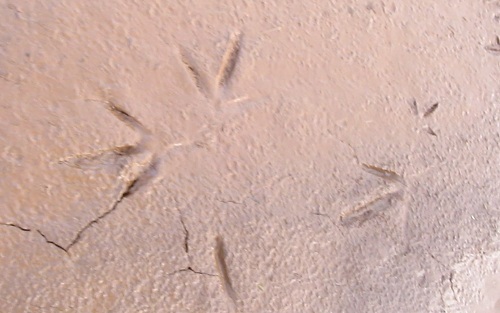 Since I wanted to get a closer look at the birds in the marsh, I made by way over the mud flat much of which was covered in bird tracks — most of them aeʻo. Mud accumlated on the bottom of my spiked tabis and each step became more slippery than the next. 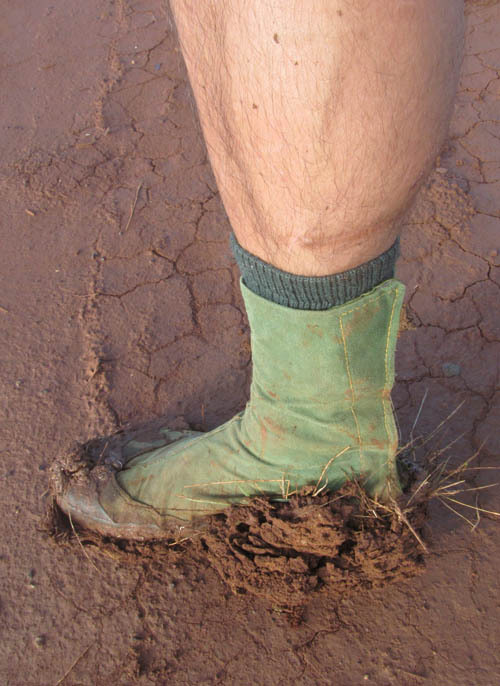 With so much mud on the bottom of my footwear, it almost became easier to slide across the mudflat to make my way to some shrubs I could hide behind to get a closer look at the shy and elusive water birds. 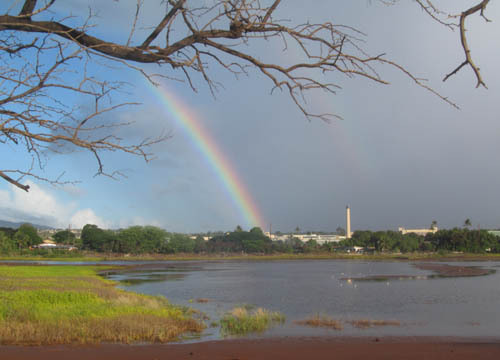 During the rainy season, rainfall fills the wetland to its greatest extent and many aeʻo come to the Pouhala Marsh and other wetlands around Pearl Harbor. Since I arrived shortly after sunrise and it was still early in the morning, some of the aeʻo were still sleeping with their heads tucked under their wings. But many others had already stirred from their slumber and were hunting in the shallow water to feed on shrimps, crabs, and other tiny creatures to eat. While making my way towards the back of the marsh where mangroves and cattails have taken over, I tried to sneak up to some aeʻo but I was detected and they took to the air. Aeʻo are wary of humans and call out to vocalize their displeasure at your presence. If you get too close, they take to the air, circle and dive bomb intruders especially when protecting their eggs and young. Fortunately, I was able to sneak up on this unsuspecting ae’o in the pickleweed and snapped this shot before it detected my presence. 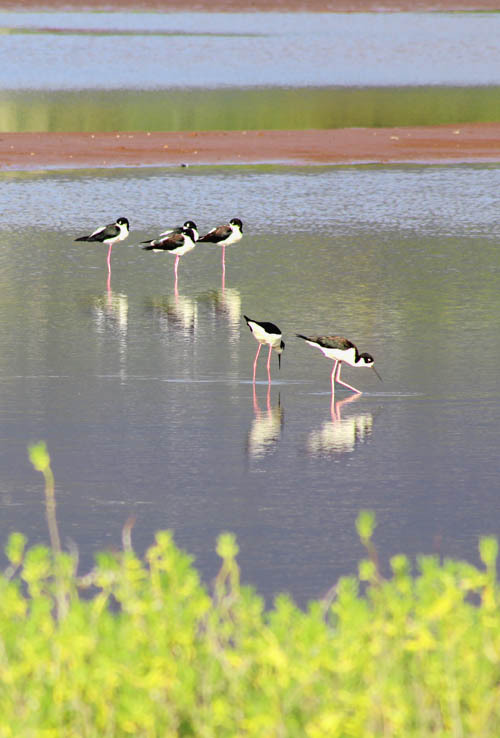 Ae’o are graceful water birds with long slender pink legs. 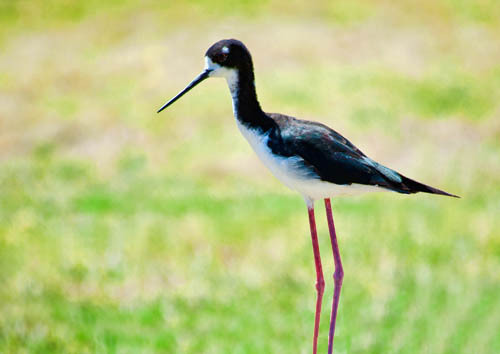 They are believed to come from North America and have evolved into a distrinct subspecies in Hawai’i. Due to loss of habitat, ae’o are on the federal list of endangered species. Another encouraging development was that many more native plants have been planted around the margins of the marsh than the last time I was here. 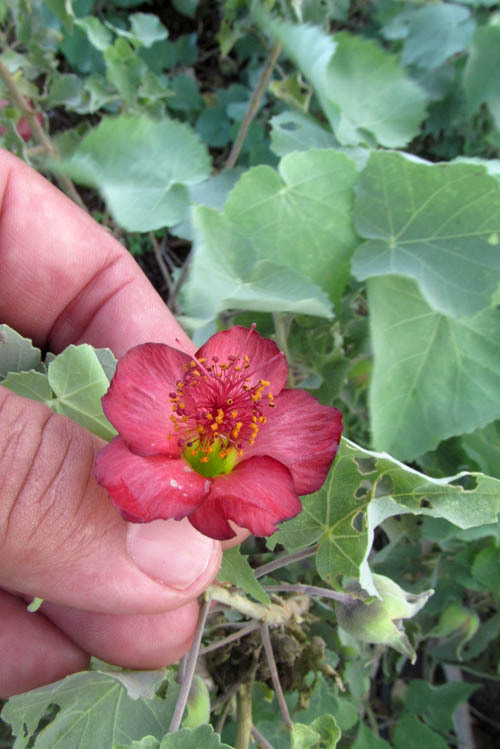 I was pleased to see the endangered ko’oloaula — the red ‘ilima (Abutilon menziesii) — in bloom with cute little red flowers. 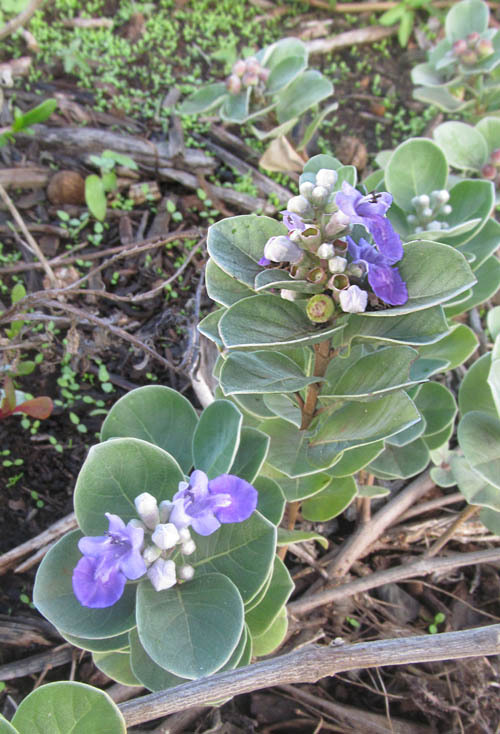 Also planted in the area between the mudflat and the stream were the sweetly scented shrubs of pohinahina — the beach vitex (Vitex rotundifolia) — which were in bloom with purple-blue flowers. 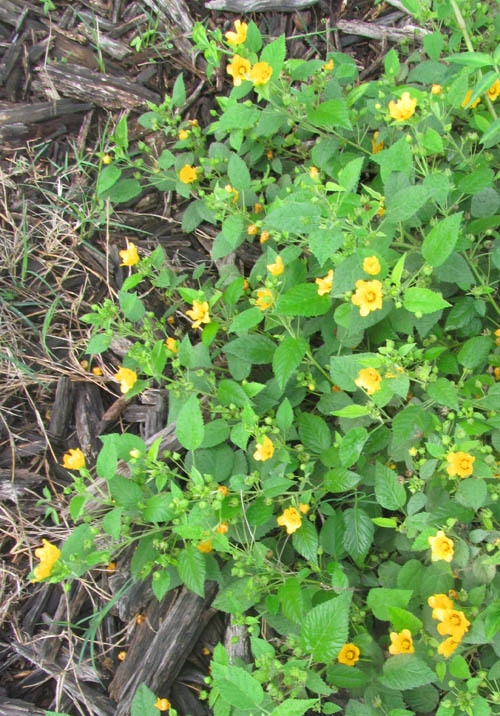 Even more profusely in bloom were ʻilima papa (Sida fallax) which crawl over the ground with many yellow-orange flowers. I also saw a number of wiliwili, naupaka, ma’o, hala and other native plants which have been planted around the edges of the marsh. Although good progress has been made restoring the native wetland, the work is never-ending. The marsh is next to a refuse transfer station where people drop-off large items destined for the land fill. When people arrive after hours when the transfer station closed, they sometimes dump their load thoughtlessly into the stream and marsh. If you would like to take part in this effort to restore the stream and marsh, contact the Hawaii Nature Center at volunteer@hawaiinaturecenter.org. Time past quickly and soon it was time to leave. While making my way back out the marsh, I reflected on the thousands of man hours put in to transform the once de facto dump into a productive wetland again. 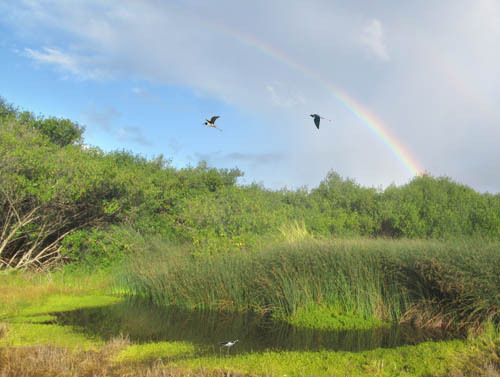 It was very appropriate to see a rainbow over Pouhala Marsh — a symbol of hope and renewal — on this 10th anniversary. Impressive strides have been made to restore the wetland and hope springs eternal for another 10 years of great progress! Thanks, Nathan – that’s a very nice write-up! It has been a lot of work, but the effort is really starting to bear fruit! Thanks… your hard work and commitment is paying off — hats off to DOFAW and DLNR! Thanks, Nate. I just played the video of this; Like going home. More Ae’o than I saw when I was home two years ago.